The Compulsive Reader: Dear America Re-Launch! I've been slipping a bit behind in a lot of things lately...as evident in my discovery of this nearly two week old article on PW about the re-issue of the Dear America books. My reaction in a word: YES!! I've not talked a lot about my reading influences as a kid, but basically I grew up in a small, small, small parochial school where the majority of the books were historical fiction and very old. I liked it very much, and even though I didn't necessarily understand what was happening most of the time (like, it took me an embarrassingly long time to make the connection between Number the Stars and World War II. But give me a break, I was eight years old. 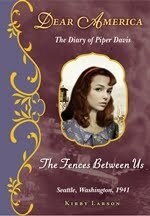 ), I loved, loved, loved historical fiction, and still do. One of my favorite sources of stellar historical fiction entertainment while growing up was the Dear America books. Not only was the package pretty and perfect in my mind (I adored the ribbon bookmark and the uneven pages), but the stories were amazing to me, every single one. It is so, so exciting to me that Scholastic is re-introducing these books to kids, and not only that, but there will be new ones coming from Kirby Larson, author of Hattie Big Sky (another excellent book!) and Lois Lowry! I think one of the coolest things about these books is the feeling that these girls I read about were so real and tangible. Following the conclusion of each diary was a bit of an epilogue, in which the author explained what happened to each character, as if they were really people that lived, and then lengthy biographical notes on the history, events, and customs read about in the book. Not only was it extremely educational, but loads of fun as well--I was way more into reading a mini history lesson if I could relate it to a book I had just read and loved. Another amazing thing about these books is that the authors that wrote them never tried to pull the wool over their readers' eyes. One Eye Laughing, The Other Weeping broke my heart in its portrayal of character Julie Weiss's loss of her family and home in World War II, and So Far From Home still has me reeling when I think about it. A Coal Miner's Bride , is, like the title not-so-subtly hints at, about a very young Polish teen who marries a man more than ten years her senior (this one still leaves me sobbing at the end). Christmas After All , Minnie Swift's holiday diary about the Great Depression, is so honest and heartbreaking, and I still read it every year at Christmas. And...all of these books are aimed at middle grade readers. Pretty awesome. I am really looking forward to this re-launch, and I'll be rooting for the success of the series. I still proudly own my stack of Dear America books (I wouldn't dream of ever getting rid of them!) 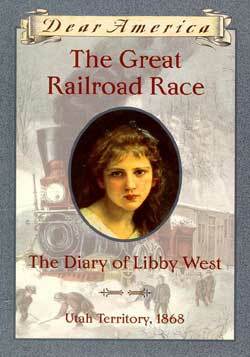 and I am recalling old favorites...I read and reread The Great Railroad Race and Across the Wide and Lonesome Prairie , and what was that one about the girl captured by Indians? One of my favorites! I sincerely hope that Dear America will be as popular now as it once was, and that the success will prompt Scholastic to release even more of the books...including the spin-off series The Royal Diaries and My America. ETA: I just read a post about the Dear America books on A Chair, A Fireplace, and a Tea Cozy, and she has brought up some really good points...look for another post about this topic tomorrow! I also loved the Dear America series, and still have all the books, so I was ridiculously excited to find out they are bringing the series back. I would also love it if there were more Royal Diaries, another one of my favorite series. thanks for the link! i read these as an adult and just loved the time periods and how gutsy the authors were. I devoured these books. Good to know they're re-publicizing them! Oh, how wonderful! These books are amazing- I read quite a few of them when my son was about a year old- the library where we lived had a huge display of them and I brought home a bunch every time we visited the library. My son is a little young for these yet, but I'm planning on introducing him to this series in a few years.